If you like an extra thick mat, but don't need the length, our Extra Thick Short Yoga Mat was made for you. This shorter-sized yoga mat is still a full 60" long, 1/4" thick and made of a durable foam with a high-tack surface for added traction. Yoga teachers, try our custom printing service to showcase your yoga studio logo on every mat! It's our best-selling mat in a shorter size! Our Short Yoga Mats are only 60" long, as opposed to the standard 72" mats, making them the perfect size for children's yoga classes! 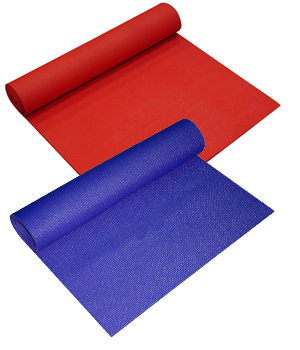 Made of durable foam with a high-tack surface for stickiness, our Short Yoga Mat is thicker for extra comfort and is the highest quality available. As with any of our yoga mats, these Short Yoga Mats can also be custom printed with your company or studio logo or design. I am 5'6" and can lie flat with my knees bent & feet on the mat. If I stretch my legs flat, my ankles and feet are off the mat. This mat is perfect for use in a small space. I keep a mat in my bodywork studio so clients can practice the stretches I give them. This gives them a clean space to practice without taking up too much room. The grip is just right and the thickness is good. Great to have the shorter option! These yoga mats are great for our after school yoga class. They came very quickly, and are a good quality, especially for the price! I am just over five feet tall. This proved too short to take to my flow yoga class, but for my personal use traveling it will be great even in cramped hotel rooms. These are excellent thick mats -- even if a little shorted than I'm used to -- for children they're just fine! Everyone likes these mats the best.